BC: Why did you want to write a book? T Ó SÉ: Well, I suppose I always had an interest in talking football and discussing it, but I never saw any benefit talking to the media when I played. When I came out of football I’d no interest in doing anything. I’d no interest in writing for newspapers or going on The Sunday Game. My attitude to most things is if I have time to do it, I’ll do it. 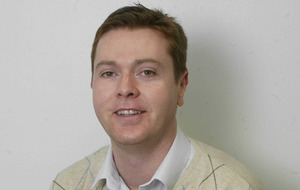 The book was time-consuming but the fact Michael [Moynihan, ghost-writer] was in Cork too was good. I enjoyed doing it, I enjoyed talking about football, I thought I wouldn’t have remembered stuff as easily as I did. It took about five or six months of hard work but it was enjoyable. And when it was put together I was happy with the final result. Like, there were people saying there was nothing controversial in it. Possibly the most controversial thing in my career was my relationship with Jack [O’Connor]. And I didn’t see that as half as interesting as the media did. T Ó SÉ: I don’t think there’s much more I could have written. I don’t think it would have made it a better book, to be honest. The only thing it would do [to be more controversial] is to possibly lose you friends. I don’t think it would have made the book any more interesting. I do think there is a line to be drawn. If there was certain stuff in the book and stories that I told I wanted to tell them. Now, if some of those stories were told in another book about me, I wouldn’t be too happy about it. If it was about me, I felt I had a right to write about it. 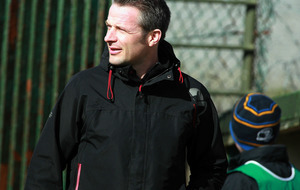 BC: There was tension between you and Jack O’Connor when he first became manager in 2004. Did Jack make you a better player? T Ó SÉ: I would say yes. He was more of a modern manager than what we had previous to that. Under Paidi [O Se], there were a lot of the old-school values that I would have taken on board and still would have had until I’d finished playing. But, I suppose, as the game was getting quicker certainly Jack saw things quicker where other managers didn’t. He was a man that believed in horses for courses; he would make sure he had his best markers on the best forwards. He would have his attacking players, like myself, on forwards that would suit me. He would try to attack the weaknesses of defences by putting forwards on players that the opposition didn’t necessarily want to have on them. I was named at number five constantly. I played there a lot but I was often moved over to the other wing or central. Did it suit me? Yes it did. I won four Allstars under Jack. I won a lot under Jack and it was possibly to do with his cleverness as a tactical coach. BC: The fondness you had for your uncle Páidí is clear in the book. Was it always going to be difficult for the man who came after Páidí? T Ó SÉ: There were pluses and minuses with every coach with Kerry. There were pluses and minuses with Páidí - he would have spoken to us [Marc, Darragh and Tomas] a lot deeper as opposed to other players and could give out to us more than he did with other players. I would say Jack found it hard enough coming in [after Paidi]; Jack found it awkward, but I would say there was no need to be awkward. We weren’t awkward. I had no issues with Jack at all. I was pissed off the way Páidí’s departure was handled and I was pissed off he was gone but I knew that Kerry football needed to move on. 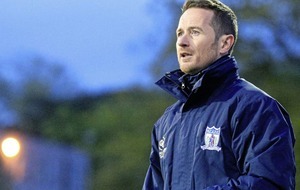 Páidí had been there since 1996 and a new coach [Jack O’Connor] came in in 2004. Time moves on. Jack probably thought we had issues with him but that certainly wasn’t true and would have taken away from our football if we got into a situation like that. BC: Why did you think Jack’s book [The Keys to the Kingdom] was a bad idea? Because he came back to manage Kerry again? BC: Steven Gerrard craved Rafa Benitez’s praise while he managed Liverpool, and Gerrard played his best football under him. Rio Ferdinand mentioned that Alex Ferguson praised him no more than half a dozen times while at Manchester United. Did you have that same creative tension with Jack? T Ó SÉ: Possibly. I don’t think I ever trusted him. I never trusted him not to drop me, even though I was going very well at the time. I was playing the best football of my career. I got Footballer of the Year in 2004 and 2005 I was playing well. For some strange reason, I had a poor year in 2006. 2007, 2008, 2009, I won Allstars. The same thing happened when Pat O’Shea came in. We won back-to-back All-Irelands, albeit with different managers, but they were still back-to-back All-Irelands. I always felt I had to play better because my uncle [Paidi] was managing the team. I think it was more to do with my psyche than anything else – to have an edge. I created all these things in my head to drive me harder. BC: Do you think you were a difficult player to manage? T Ó SÉ: I’d no issue with the trainers. It just seemed everything was drawn out and longer. Sessions went from an hour and 20 minutes up to an hour and 45 minutes. Everything was longer. Meetings afterwards were longer. The time you had to put in to be an inter-county player, all that stuff made me cranky. I don’t think I was hard to manage though. I think I was always part of the craic in the dressing room. Younger lads coming in might have seen cliques – me and the brothers, Eamonn Fitzmaurice and that. But I thought we were very good with new players coming in. I wouldn’t have said we were difficult to manage at all, no. T Ó SÉ: If Jack had told us: ‘This is to build strength in your legs – jog up this mountain 25 times’, I would have done it. But going up a f****** mountain for the sake of walking it, I didn’t see the point. Jack had beautiful scenery in south Kerry. I don’t think we needed to go up a mountain to appreciate it. T Ó SÉ: I’d no problem with the style of football the Ulster teams brought in. We played against the best teams that came out of there – the Tyrones, the Armaghs, the Donegals and the Monaghans at different stages as well. I think that Tyrone team had unbelievable footballers. T Ó SÉ: You look at Dooher, Canavan, O’Neill, Cavanagh, McGuigan. You had Gormley, Jordan in defence – great footballers. They had a good mix of players. 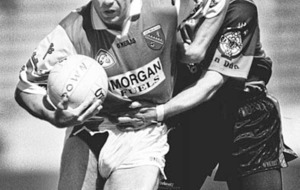 I mean, Kevin Hughes was vital to that Tyrone team around the middle of the park. They had defenders who could attack, they had the workers – men like Dooher, and skilful men like Canavan – and hard men like Canavan. Tyrone had that mix. Dublin have that mix. I don’t think Tyrone were ever as defensive as Donegal. 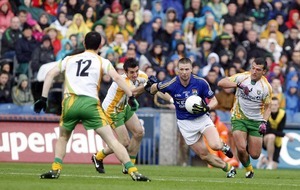 Like, there was no team that could play like Donegal in their pomp. You have to admire that too. People give out about them… But the five All-Irelands I lost, I would have swapped it for winning them playing defensively. I would have went defensive for the whole lot of them. BC: Kerry were no shrinking violets either. 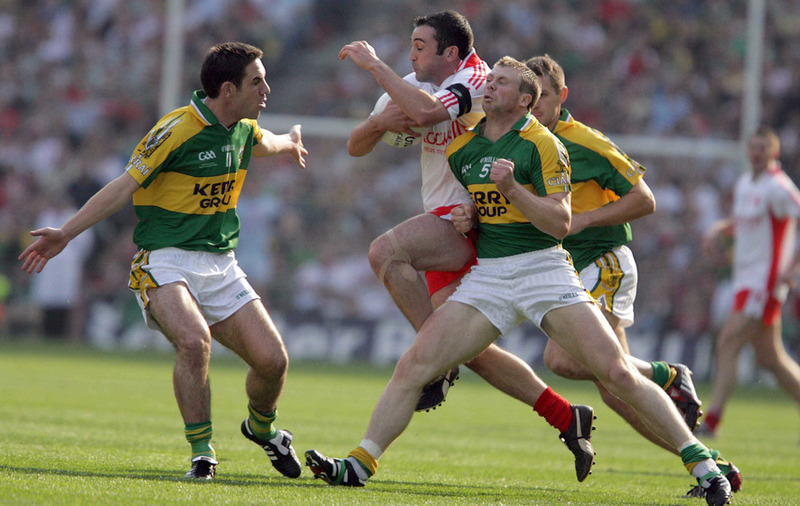 In the 2006 All-Ireland quarter-final against Armagh, Kieran McGeeney was fouled six times and six Kerry players were yellow-carded for those offences. I think you got a yellow card for a foul on ‘Geezer’ that day. Did Kerry target him? I do think we recognised that he was their spiritual leader. 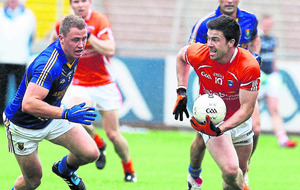 We needed to stop him if we wanted to stop Armagh. And that was probably our thinking. We got hurt badly by Armagh in 2002. The thing with Kerry is, when you lose, you don’t start complaining about it. You hurt and you hurt a lot inside – but you bring that hurt to the next meeting. I think there was a lot of hurt from ’02. There was a feeling: ‘We’re not going to lie down this time’. Now, sometimes that doesn’t work. Against Tyrone in 2005 and 2008 it didn’t work. I was actually doing well enough in the first half, but McConville was a clever footballer. And I think he got man-of-the-match that day and the goal was the changing of the match. 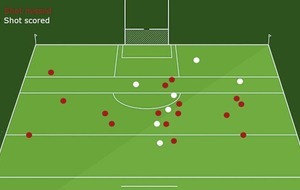 I suppose that’s where Jack’s tactical nous would have come in; he would have put somebody on McConville. Jack would have seen stuff like that and changed it. Do you know what, as the years went on, I would have called it myself. I do it at club level. If I’m being dragged inside I would just swap with a fella. BC: Was that transition after 2003 painful for Kerry? T Ó SÉ: Yeah. Look, Kerry were always adaptable. Kerry were always going to change and they realised that a high-intensity game had just arrived. We weren’t expecting that from Tyrone in 2003. In 2004, we came back strongly and we did have an intensity that wasn’t there previously. We put our heads down and worked harder. One of the biggest things about the northern teams was their work off the ball. They worked harder than other teams off the ball, in terms of putting pressure on players. To perform under that pressure, you had to move the ball a lot quicker, you had to think faster, you had to be conditioned a lot more to that kind of situation. That’s what all teams are trying to do now. You try to make the right decisions under pressure. T Ó SÉ: I learned not to take anybody for granted. I learned just because you were on the Kerry team and marking some of the best players in the country [in training] didn’t mean you could go out against the likes of Tipperary or a so-called weaker team or a so-called lesser player and take him for granted. Certain players have it over certain players. I learned that day: number one, never go into a game without being prepared and not knowing what the player you were marking was all about; number two, I never liked marking small fellas. I got away with not marking small fellas for most of my career. It was an awful start marking Aidan Dorgan. It bothered me big-time. It crushed my confidence for the rest of that year and I never made it back into the team after it. But I learned from it and I think I came back stronger from it as well. T Ó SÉ: I’ve three brothers and they wouldn’t do it for me, I tell you that! Dara is a very, very bright guy. The only worry I had was if the professor was looking at that essay and another one, he’d be saying: ‘What is going on?’ Dara is a fierce good guy, a solid guy. A loyal guy and a very talented fella in all facets. He’s very, very sharp and he thinks about the game a lot. BC: In the summer, in your role as a pundit on The Sunday Game, you had a right crack at Brian Cuthbert, the Cork manager. That kind of jarred with your previous punditry. And you got a bit of stick for it. I’ve been in Cork for so long and I see the talent that is there, I’ve seen the politics down there. I see what’s going on. I just felt there was no consistency at all. I was asked about Cork at that gig. I didn’t see anything wrong with what I said, to be honest. What I did say, they lacked leadership, and I think they do. They’d turned up in Killarney and played outstanding – but do that five times in a row. That’s what leadership is about. I was going into the Nemo dressing room with [Cork players] Barry O’Driscoll and Paul Kerrigan in there and it was awkward. I wasn’t trying to best nasty, I was just trying to give an honest opinion on it. BC: You wrote in your book: ‘Mouthing? I found that funny. How could a fella mouthing put you off your game?’ Some of the northern teams get a bad press over ‘sledging’. What’s your general view on ‘sledging’? T Ó SÉ: I never came across any personal stuff. Now there have been a few serious incidents, so that side of it is bad for our game. If you’re having a bit of a crack and you throw a few comments here and there I’ve no issue with it. We’ve all come across that on the field; if there’s a skirmish you would come in and say something to another guy. But if it’s constant, aggressive, personalised stuff going on, it's ridiculous and has no place in the game. If it was said about me that I was at that kind of stuff, I’d be embarrassed. T Ó SÉ: Yeah, I hate losing more than anything. We lost a lot of games, a lot of big games, we lost to Tyrone a lot. I’d love to have beaten Tyrone. We didn’t. I suppose the biggest one was with the club. That was a rollercoaster year [2003/04]. We went so, so close to creating unbelievable history that wouldn’t be repeated. We’ll find it very hard to win a county championship again. It’s a very, very hard journey to get to the All-Ireland with your club. That’s why I admire Crossmaglen so much and the likes of Nemo Rangers. For a small club and the amount of people living in the area it was phenomenal what happened that year. BC: Do you miss playing for An Gealtacht? T Ó SÉ: I do but I’m based in Cork for work and it’s a two-and-a-half hour drive to get there. I wouldn’t be able to give them the commitment. I had no intention playing for a Cork club, I just retired fully. But it crept back into me. I just wanted to play ball again. I went to play ‘B’ football and of course I was pushed up the line very fast and I’m enjoying it at the moment. My body is feeling the creaks though. My back isn’t great. I’d love to be still involved with An Gaeltacht. They’re still my club, they’ll always be my club. BC: You’re 37 now. Will this be your last year with Nemo Rangers? T Ó SÉ: I’ll be 38 early next year. I’m just going game by game. My hamstrings aren’t great at the moment, so I’m not sure. BC: You talk fondly about the car journeys to and from training. Is that something you miss about your Kerry days? T Ó SÉ: There are bonds created during those journeys. It can’t be serious all the time. You have to have some way of having a bit of fun. Nights out are great and all that but you don’t have many of them. The over-nights were good craic and the car journeys too. That’s the things you miss because you laughed a lot, you were laughing with your buddies. BC: Kevin McStay made you feel really at home when you joined The Sunday Game. Have you enjoyed that experience? T Ó SÉ: I have enjoyed it. It’s been very good. It’s a tough old gig. It’s a long, long day and you need to clock in the hours and know your stuff. In the beginning, you would see a passage of football and you’d want to speak about it all day long and you'd end up saying something completely different to what you were going to say. I don’t try and think about it any more. I just call it and see it there and then. In fairness to McStay, he’s very kind. What I like about him is that he’s not there to be controversial. He calls it as he sees it. He has unbelievable knowledge. BC: You would have ran a mile from journalists during your playing days. Why? T Ó SÉ: Look, at the time I didn’t see any benefit talking to the media before games. To be honest, I don’t see the benefit now. I think some players are enticed to do press conferences and they get a few bob for it or whatever, but where is the benefit? I’d still question it. You’re going to be asked about the opposition, about their style of play and the player they’re going to be marking… that’s my view of it anyway. T Ó SÉ: Yeah, a fella might mean something completely different in an interview and it comes across in the paper as something else; I would jump on it. BC: Contrary what Joe Brolly and Martin McHugh have said in recent years, you say that Colm Cooper was the best you ever seen. Why? T Ó SÉ: Darragh was brilliant. Maurice Fitzgerald was outstanding. I played with some of the best around. I’m sure the Tyrone lads would have something to say about that. I suppose when you train with fellas and you see stuff, the ‘Gooch’ had everything. He still has. I think he’ll have a say in next year’s Championship as this year was possibly quieter than other years for him. He was being double-marked in every single game he played and he still shone. I don’t know how many Allstars he has. The ‘Gooch’ is the best there’s been in the GAA for a long time. 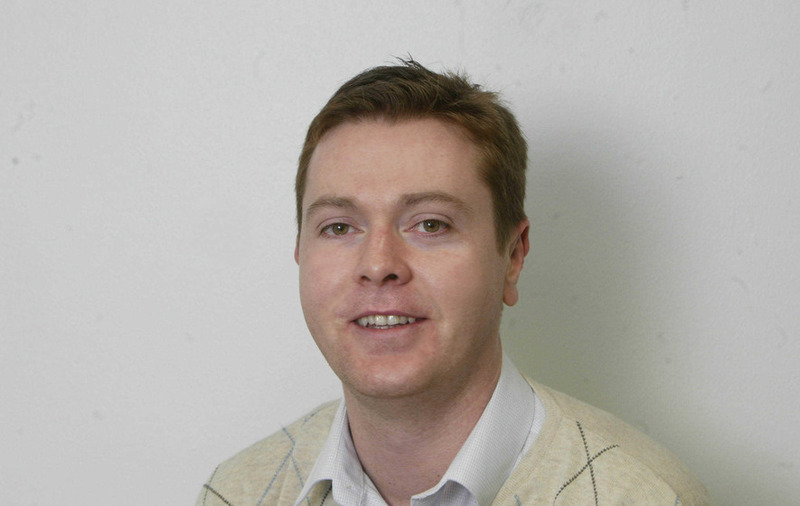 BC: How are enjoying working with Joe Brolly? T Ó SÉ: I wouldn’t even begin to argue with Joe. Arguing is Joe’s profession. I just say to Joe: ‘Joe, you’re wrong. That’s it.’ You just tell him he’s wrong and leave at that. TOMÁS Ó SÉ will be at St Patrick's, Loup GAC this Saturday (12-2pm) to sign copies of his autobiography: The White Heat. Everyone welcome.